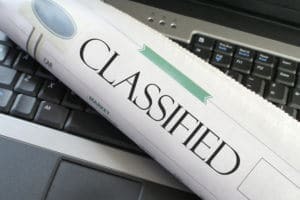 Selling Your Used Car For Cash - Beware Of Classified Ads! While we recommend selling your used car for cash in Honolulu to a reputable company, many people consider listing their used vehicle on Craigslist or other classified ads whether online or in the newspaper. This may work out well for you, however it’s important to be aware of the dangers or even scams of going this route. We have some info on avoiding a bad outcome you may find helpful below! Avoid becoming emotionally involved. Whether a potential buyer wants you to ship your vehicle to another country or claims to be a member of the military in order to gain your sympathy, don’t jump on selling your vehicle without asking many questions so that you feel confident and there is no question the inquiry is legit. Think about what’s involved when you list your used car online. Whether on Craigslist or another site, think about what could go wrong. Crimes aren’t all that common, however if you meet with a potential buyer you will be meeting with a stranger, and we’ve all heard the horror stories. From a test drive to money exchange, it can be an unsettling experience. It’s a good idea to try your best to determine whether the interested party is legit by speaking over the phone and ensuring he/she has a good email account that allows you to contact them. While texting is common these days, you’ll avoid any swindlers by chatting over the phone and going with your gut instinct if anything feels shady. Don’t be too anxious to sell your used car. When a buyer offers you money it can be exciting, but slow down and think things out. A legitimate buyer will likely have plenty of questions about your vehicle – and most will try to negotiate a lower price. If a prospective buyer agrees to your price, offers more than you’re asking, doesn’t have any questions at all, or lives in another city or state and doesn’t ask to see the car in person, it should put up a red flag. Meet in an area that’s safe. When a buyer comes across your online ad and asks to meet in person, only agree to meet in an area where you feel safe. Take a friend or family member along with you if it makes you feel better about the meeting, or choose a location that is well-lit and where there are people around. Lots of police departments today have “safe zones” with video surveillance. A legitimate buyer who’s genuinely interested in your car won’t mind meeting in the area of your choosing. You can put up an ad on Craigslist or other online ad sites, but the quickest way to sell your used car for cash in Honolulu is to work with CarMark Hawaii! Fill out our online appraisal form and get the cash you need right now.